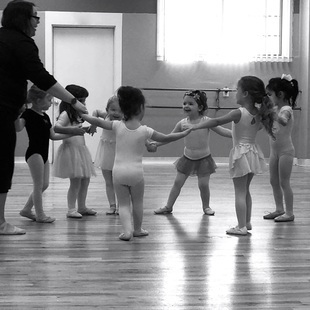 This class is designed to develop motor skills and coordination, as well as to nurture the love of dance in preschoolers. Children are kept moving with song and dance games within a class structure. Ballet language is also taught in this 45 minute class. This class is designed to set the foundation for dance technique. Fundamental ballet and tap technique is taught with beginning barre and center floor exercises. Classes in Classical Ballet are graded according to the ability level of each class. The entire ballet barre is taught along with adagio and allegro combinations. Tap classes are graded according to student ability. Each class includes warm-up, single and double sound combinations, time steps, etc. This popular form of dance is offered to students in grades three and up. Jazz technique is taught with varied styles and combinations. Explore all forms of jazz dance while focusing on turns, progressions, isolations and combinations across the floor. Jazz is offered to students in grades 3 and above. This expressive form of dance draws from the Graham, Horton and Dunham techniques, among others. Basic elements of breath control, gravity, balance, alignment, rhythm and spatial awareness are learned through warm up, progressions and center combinations. Modern Dance is offered to students in grades 8 and above. A high-energy class that uses the latest sounds in rap, R&B and pop music together with movements influenced by some of today’s hottest video choreographers and presented in an age appropriate manner. Hip Hop is offered to students in grades 6 and above. A dance form taken from ballet and inspired by jazz, lyrical dance emphasizes expression, fluid body movement and control. Offered to high school students with ballet training only. Peggy received her Bachelor of Fine Arts degree from The Boston Conservatory, where she danced with their resident company, The Boston Dance Theatre. She is a member of the Dance Teachers’ Club of Boston and is the owner and director of the Walpole Dance Center. Kristen is an alumna of the Walpole Dance Center. She received her degree from the Dean College School of Dance, where she performed with their resident Dance Company. Kristen developed our Modern Dance program and also teaches Ballet, Jazz, Tap, Lyrical and Hip Hop. Kristen is a co-founder of Next Generation Theatre Company, as well as the choreographer for Walpole High School's Theatre Club and the summer theatre program at MockingBird School of Music. Katie is an alumna of the Walpole Dance Center. She received her degree in dance from Hofstra University, where she had many performance opportunities. Katie introduced our studio to Hip Hop and also teaches Ballet, Tap, Jazz, Modern, and Lyrical.